Easy Journey to other Planets is quite amusing and at the same time rather sad. It intends to document the power of Bhakti Yoga, but the entire basis is an unsubstantiated criticism of modern science. The publisher, the Hare Krishna Movement, still insists that NASA’s moon landing was a fake and that man’s inspiration to travel to other worlds can only be attained by the practice of Bhakti yoga. 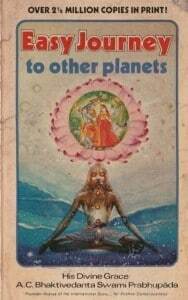 Srila Prabhupada originally wrote Easy Journey to Other Planets in the 1960’s at the height of the Apollo space program and the book is dedicated to “Scientists of the World”. Srila Prabhupada also incorporates the, at that time, newly discovered science of antimatter and he chats away about how nothing of this is new, everything has been discovered in ancient time if you read the Bhagavad Gita the right way. 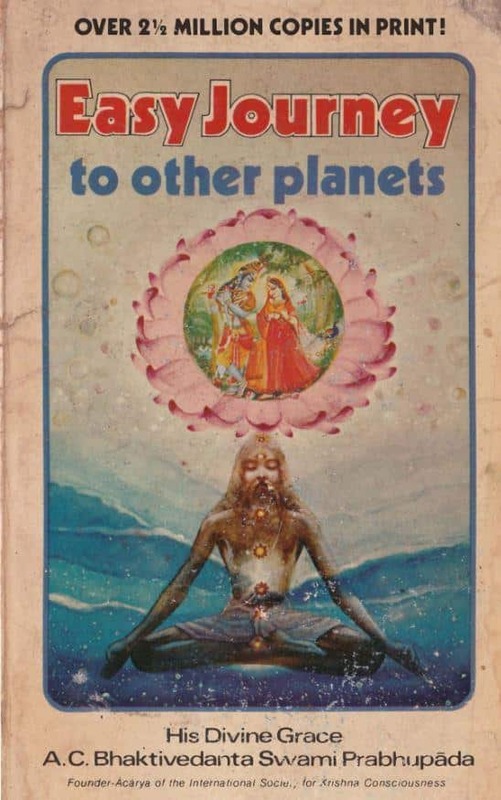 Srila Prabhupada originally wrote Easy Journey to Other Planets in the 1960’s at the height of the Apollo space program and the book is dedicated to “Scientists of the World”. materialistic society strives in vain to be permanently happy in the non-permanent world.